Chop the spice paste ingredients in a mortar and pestle until fine. Heat the oil in a heavy pot, add the spice paste, cinnamon, cloves, star anise, and cardamom and stir-fry until aroma is released and aromatic. Add the beef and the pounded lemongrass and stir for 1 minute. Add the coconut milk, tamarind juice, water, and simmer on medium heat, stirring frequently until the meat is almost cooked. 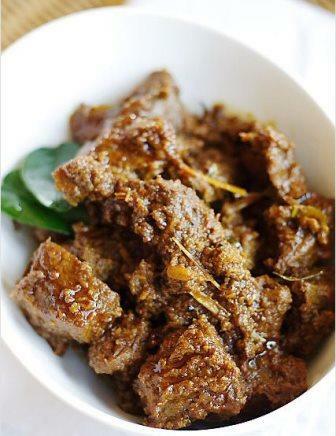 Add the kaffir lime leaves toasted coconut, sugar, stirring to blend well with the meat. Lower the heat, cover the lid, and simmer for 1 – 1 1/2 hours or until the meat is really tender and the gravy has dried up. Add salt to taste. If not sweet enough, add more sugar to taste. Serve immediately with steamed rice and a sprinkling of toasted coconut. To prepare the kerisik or toasted coconut, add the grated coconut to a dry wok or heavy iron frying pan and stir continuously until golden brown.